A 83-year-old man complaining of disphagia was referred to our hospital for further examination and treatment of esophageal cancer. An upper gastrointestinal endoscopy showed the circumferential stenosis of the esophagus at 33~38cm from the incision teeth. The mucosa of the stenotic part was almost intact with slight erosion and the biopsy specimen from the erosive part indicated squamous cell carcinoma. Computed tomography revealed a swollen lymph node around cardia but no distant metastatis. He was diagnosed as type 4 thoracic esophageal cancer , T3N1M0 StageIII and underwent mediastinoscopic transhiatal esophagectomy with lymph node dissection of the lower mediastinum and abdomen. The technique consists of hand-assisted laparoscopic gastric dissection, mediastinoscopic dissection of the middle and lower thoracic esophagus under pneumoperitoneum and blunt dissection of upper thoracic esophagus. Postoperative course was uneventful. Presently, three years after surgery, no recurrence is noted. 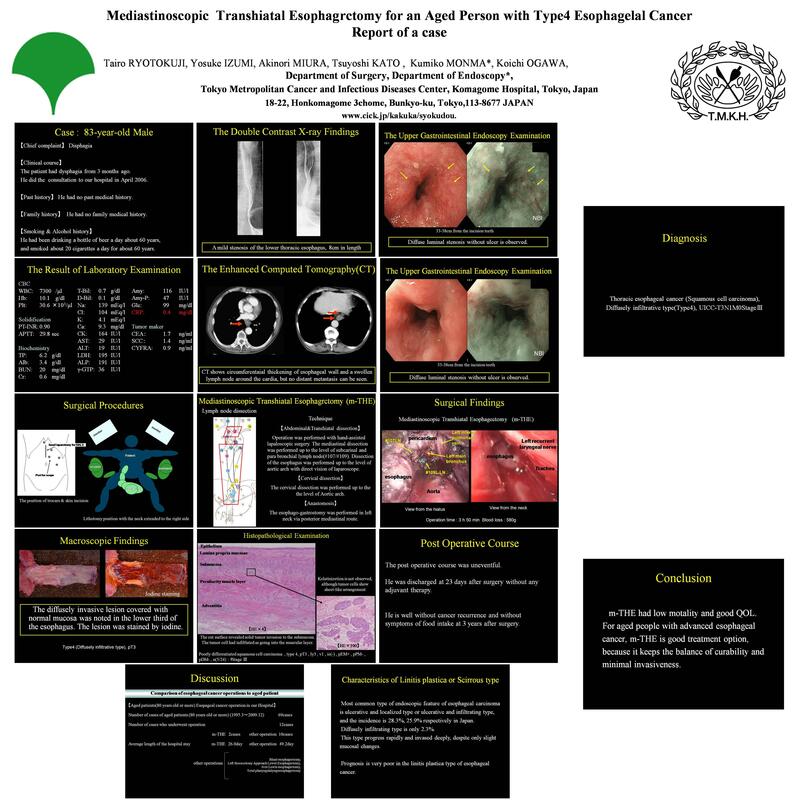 We sometimes wonder how to treat aged people with advanced esophageal cancer of predicted poor prognosis., and the mediastinoscopic transhiatal esophagectomy is a good treatment option for them, because it keeps the balance of curability and minimal invasiveness.